My kids LOVE Mexican food. I love cooking in my slow cooker. This dinner is a match made in heaven. If I had a recipe category called not-really-a-recipe-recipe, this Shredded Salsa Chicken in a Slow Cooker would be at the top of the list. Do you have a favorite salsa? Do you have chicken breasts? Dump them in your slow cooker. Turn to low for 6 to 8 hours or high for 3 to 4 hours. Shred chicken. For real. That’s it. Dinner. Done. I told you that this doesn’t even count as a recipe. It is so easy, and so good! Shredded salsa chicken is how we keep Taco Tuesday going strong when mama can’t even stand over the stove 10 minutes to brown some ground beef. 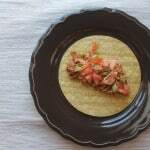 The salsa is a key ingredient in this meal … if you use spicy salsa, you will have spicy chicken. Choose wisely. 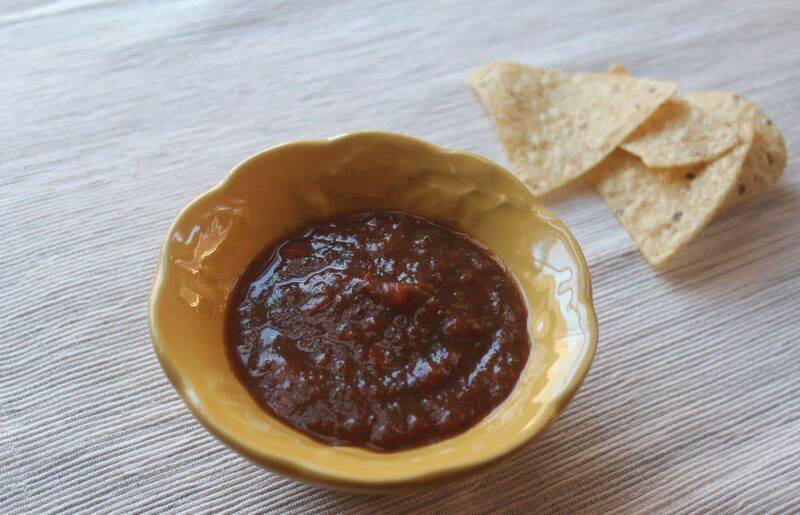 The photo below is a picture of the best salsa I have ever had… I would tell you where you can buy it but my friend makes it. If you move to Charlotte, I can hook you up. Get out your slow cooker, find your favorite salsa, and prepare your taco toppings. Or, better yet, have your kids prepare the taco toppings – green onion, tomatoes, lettuce, shredded cheese, avocado … anything goes. Hard tacos? Soft tacos? We keep soft corn tortillas in the fridge at all times. Wrap a couple of soft corn tortillas in paper towels and heat for about 15 seconds so they are super soft and warm, ready to be filled with your shredded salsa chicken. Serve with rice and beans or a beautiful green salad… Maybe the adult diners deserve a margarita? After this winter, I think we all need a margarita. Can you taste summer? It’s coming, I promise. 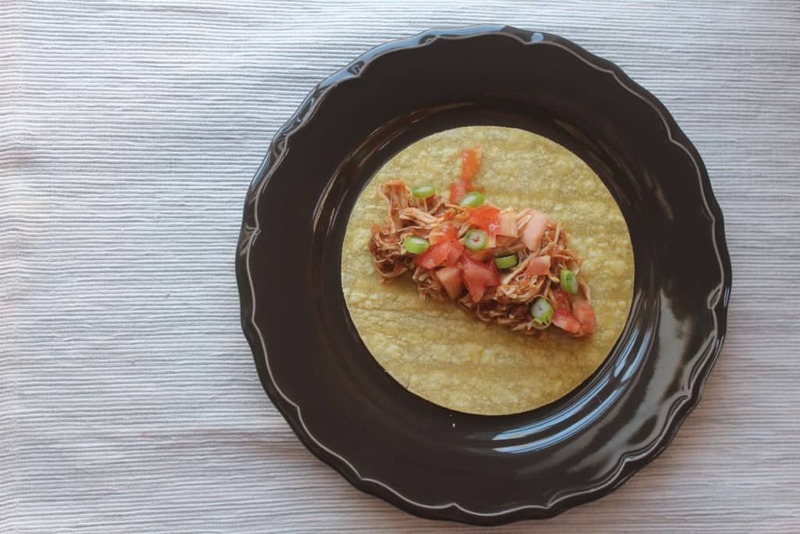 Until then, make yourself a tasty margarita and enjoy this easy slow cooker shredded salsa chicken. Two ingredients. Almost too easy. Sprinkle salt and pepper on the chicken breasts. Place in the bottom of slow cooker. Pour 2 cups of salsa evenly over chicken breasts. Cook on low for 6 to 8 hours or high 3 to 4 hours. Make sure chicken remains under the salsa liquid. Using two forks, shred chicken by pulling the chicken apart in opposite directions. If the chicken does not pull apart easily, cook it for longer. Serve in tacos, enchiladas or on top of your favorite salad. I love, love, love how easy this is! And so perfect for Taco Tuesday! Thanks, Sarah!! We LOVE taco Tuesday here. So perfectly easy! I really need to use my slow cooker more often. Going to give this a try! Thanks, Judy! It really is perfectly easy! I sometimes forget how handy my slow cooker can be and keep it in the pantry for longgg stretches. Hope you try it! OMG, I might move to Charlotte just for that salsa, lol! I love a good slow cooker chicken recipe and this one sounds perfect! Excellent meal for a busy weeknight! Everything is better in a slow cooker! I love mine, and love making delicious dishes just like this on busy nights!